Weathered And Distressed Technique Super Easy And Cheap! I love creating weathered and distressed finishes on my furniture pieces. I’m always experimenting with paint and trying to create new ways to add these fun finishes. Many months ago I painted a cabinet in my office that was once my dining room. It’s a metal cabinet that I gave new life by adding appliques and I also added this technique to that metal cabinet. This is the same technique that I’m going to share with you today. If you are curious this is the cabinet that I am referring too. It’s an old metal cabinet that was spray painted back. I painted a base coat of flat paint then created a weathered and distressed look. You can read more about this click on this link—> Metal Pantry Cabinet. This technique is super easy to do. I promise that you cannot make a mistake. 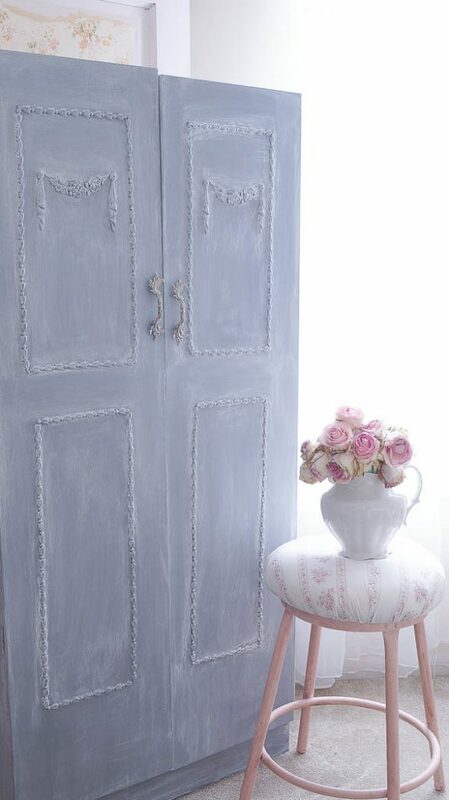 This weathered and distressed look really softens the look of a piece. 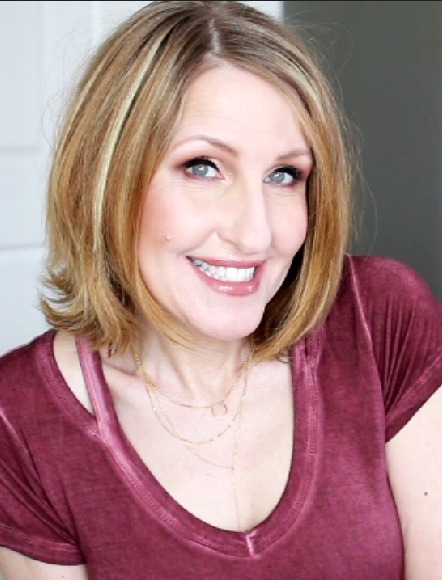 I’m going to explain how I created this look and I’ve also created a short video that you can watch as I am creating this look. First you will want to paint your piece. 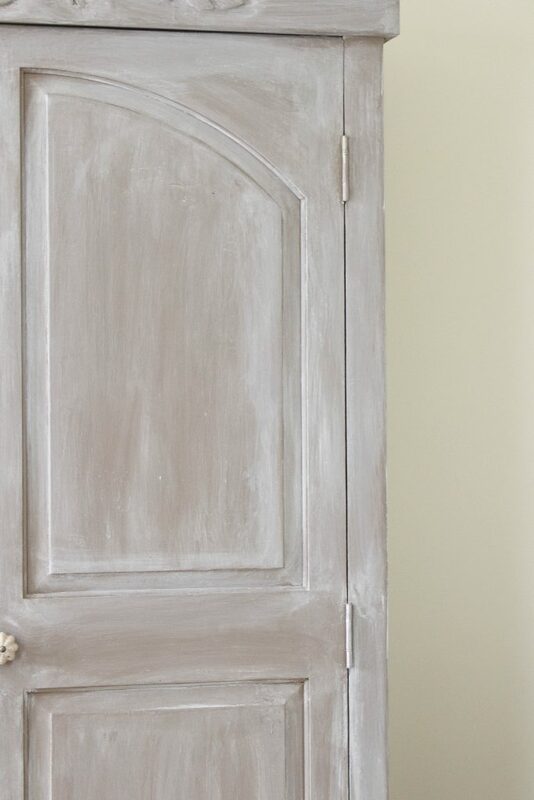 I used mocha from Heirloom Traditions paint. I painted my armoire two coats of paint. Once it was dry I started to create my weathered look. 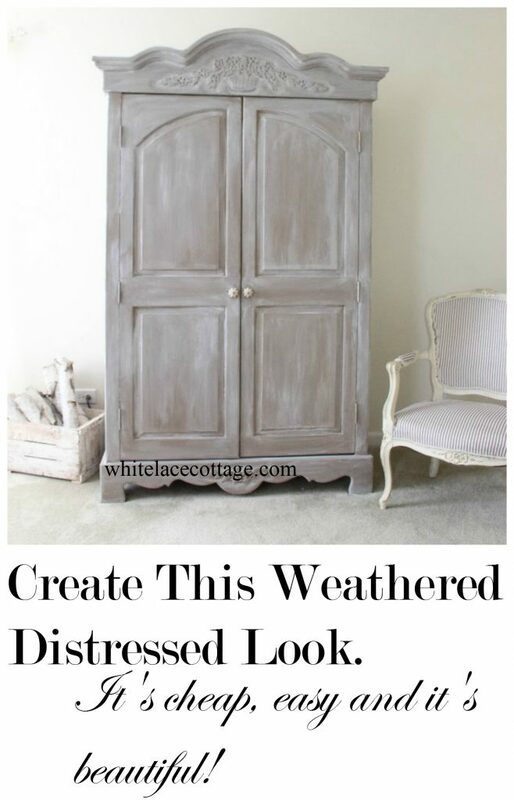 Once your piece is completely dry you are ready to start creating your weathered and distressed look. Dip your paint brush into your bucket to get it wet. Then dip the brush into your paint. You want your brush to be pretty wet, but not soaking wet to wipe the excess water off on the edge of your bucket. With this technique it’s much better to work with a wet brush. If your brush is too dry you will be adding too much pain onto your piece of furniture. Start in a small section and start painting your piece with your white paint. After you’ve applied your white paint to a small section take your damp rag and start gently wiping the paint off of your piece. You only want to leave a light coat of paint on your piece. If you feel that you’ve wiped off too much of the paint that’s okay you can go back over it. If you feel that you didn’t add enough paint go ahead and add more paint then take your damp rag and wipe over that section again. Make sure to dry and go in one direction and be very gentle. Step back away from your piece to see if you missed an area or if it looks uneven. This weathered and distressed look is very similar to dry brushing. But I feel that I have much more control with this technique and it’s a much softer look. I had an issue as I was painting my piece that I mention in my video but I will share it with you here as well. I mixed a few other colors with the mocha paint color hoping to create a metallic finish. Well I just wasted paint because I couldn’t see it. 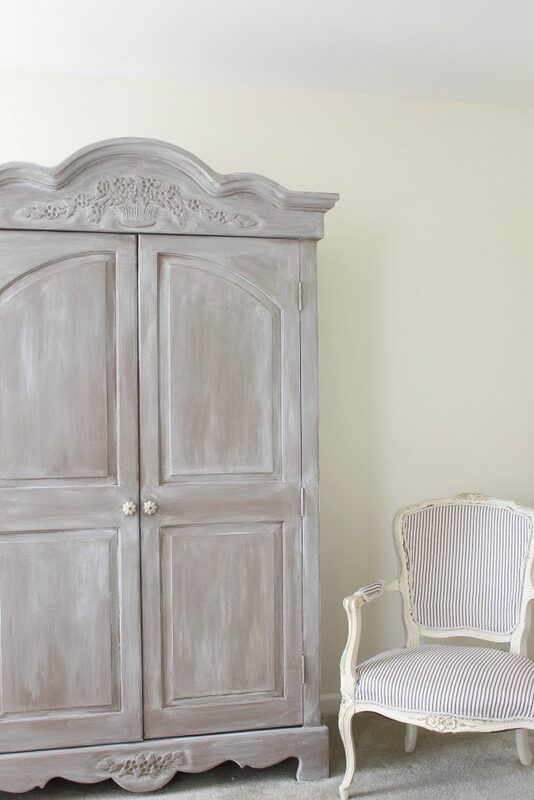 But, mixing that in with my paint changed something in my paint because as I was creating this weathered and distressed look on my armoire the paint was coming off which has never happened before. I know it’s because of the other paints I added. To fix this I added a coat of matte clear waterbased top coat to the armoire. Once it was completely dry I started using this technique again and it worked like a charm. So if that ever happens to you just stop and add a matte finish water based top coat before you start creating this technique. So what do you think about this finish? I really love the look of this and it was so super easy to create. If you have any questions on this technique please let me know in the comments below. I always reply to comments through email. Here’s one last look of the before and after of my cabinet. These links are affiliates. Please see disclosure policy. Click on the links below to purchase. Make sure you use the code WHITELACE to receive 10% off of your order. This is great! I’ve done dry brush to get a weathered look but had never heard or read about this method. When I have the right piece (after I un-bury myself from the stacks of projects in my garage), I’m going to look for a piece to try this on. I really loved watching this video. You did such a good job on this project and I learned a lot. Could you do layers of different colours? Loved the green and now love the pickled look. It makes a dramatic change in the feel of the piece. This version is soft and ethereal. Good information. Thanks. It’s absolutely beautiful, soft and classy. I love it! Will definitely be trying this technique in the future. Thanks! Absolutely LOVE IT! Thanks for sharing.